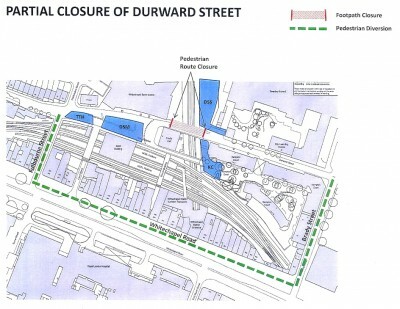 The quiet cycling route behind Whitechapel Station that connects Vallance Road to Brady Street, Durward Street has been closed for the next four years. I spoke to the Crossrail site supervisor and he said the pedestrian/cycling route has closed so that they can dig trenches for the new station. The irony was lost on him when I said that 100 years ago trenches were also being dug for four years. An alternative route has been signposted down Fulborne Street onto the Whitechapel Road but this is unsuitable for cyclists that are not confident using a main route however, this route will also close early next year for the continuing expansion of the station. Cyclists will then have to use the Whitechapel Road between Vallance Road (a junction that has claimed a cyclist's life 3 years ago) to Brady Street. List of all award winners. With a close election forecast this is your opportunity to urge candidates to support improved cycling facilties and to support the LCC's Space4Cycling campaign. The event is open to all and refreshments will be provided. For full event timings see our diary page. Four public pike pumps have been installed within the borough providing cyclists with a "convenient free facility to pump up deflated tyres". This Find a Pump map shows their locations as well as those in Hackney, the City and beyond. Councillor Harun Miah moved an amendment to add to the third point under ‘this council resolves’ reference to the Cable Street cycle lane, which was accepted by Councillors Pierce and Mukit. Following debate the motion as amended was put to the vote and was agreed. CS2 was recently labelled an “accident waiting to happen” by the coroner investigating the recent deaths of cyclists along the route. That despite the high number of accidents involving lorries Tower Hamlets Council only scores 3/5 on the London Cycling Campaign’s Safer Lorries rating. That over 10,000 Londoners have written to the Mayor in support of the London Cycling Campaign who want an urgent review of CS2. Labour London Assembly Member John Biggs has led the way campaigning passionately on cycle and pedestrian safety for many years. That he will tomorrow host a high level CS2 Safety Summit giving local residents and cyclists who use the CS2 an opportunity to air their views on what actions should be taken and to agree a list of demands for the Mayor of London and Transport for London. Labour representatives in the GLA have consistently put forward tangible solutions to make London safer for cyclists including calling for segregation of cycle lanes as well as an early phase for cyclists at traffic lights. That cycle safety is a vitally important issue not only for road users but also to support cultural change and encourage more people to take up cycling. John Biggs’ work on the London Assembly over the past years has helped to highlight this as an important issue and that his proposals for segregated lanes and early phases for traffic lights would help to protect cyclists. The Mayor of Tower Hamlets’ dangerously ill-designed cycle scheme in Bethnal Green which was condemned by the Cyclists in the City group as a “new contender for the worst bike lane in London” and labelling its creation as “an utter scandal” with “absolutely no excuse”. That during the planning process Tower Hamlets Wheelers described the scheme as "a waste of money" saying it was "unclear who was meant to be benefiting" from the work. The IbikeLondon blog described the Bethnal Green route as “woefully inadequate; narrow, within the dooring zone of the parked cars, and ridiculously short before they spit you back in to the road from behind some parking.” And actually encourage cyclists to boycott the paths as the (now narrower) roads are actually safer than the cycle route. That whilst the Mayor of Tower Hamlets may say the right things on cycle safety he does not understand that cycling cannot be treated as a fashionable add-on. It needs to be integrated into the heart of road design and that badly designed cycle routes, whether CS2 or the Bethnal Green route actually put cyclists in more danger. That the widely condemned Bethnal Green route puts cyclists at more danger as a result of both the poor design of the cycle route and the narrower road space. To call on the Mayor of London to attend tomorrow’s CS2 Safety Summit to hear the concerns of local residents. To support the proposals resulting from John Biggs’ consultations with residents and cyclists at the CS2 Safety Summit and to write to the Mayor of London in support of that work. To call on the Mayor of Tower Hamlets to fully review the Bethnal Green cycle route project and the Cable Street cycle lane and to report back to Council on what went wrong. To support the London Cycling Campaign’s Safer Lorries Campaign and to strongly encourage contractors used by the Council to meet its Safer Lorries conditions. 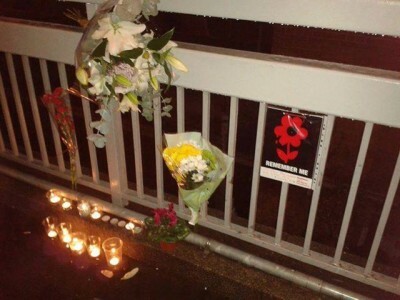 Yesterday it was 2 years from the day when Svitlana Tereshchenko was killed at Bow Roundabout. On behalf of friends and family we would like to thank Gerry Matthews and other 3 ladies from Tower Hamlets Wheelers for joining us last night and sharing our memories with us. Many thanks! Long term good news for anyone who uses the foot tunnels to cross the river - renovation work has now resumed, following a long period of inaction. However note that the Island Gardens-Greenwich tunnel will be shut every night between 20.00 and 05.00 during November, but fortunately now you can take your bike on the DLR after the evening peak period so there is an alternative up to about midnight.